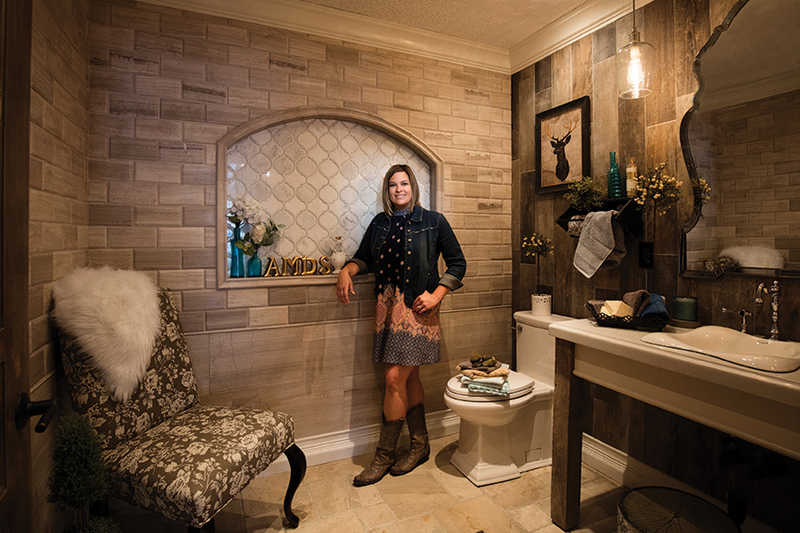 Anne Boedges, President and Designer of Anne Marie Design Studio, is brimming with bath knowledge. SLHL: How do you help homeowners come up with a bath design they are seeking? Anne: First, I learn about the client and who is using the space. Then, I genuinely listen to them… their dream spaces, their “Pinterests,” what they envision and I ask what functionality is missing for them in the space. I try to drive each project by the client’s needs. SLHL: When doing a complete remodel, what selections does a homeowner need to make first? Anne: The most important portion of this process is the layout. Once that’s determined, we review and select which cabinetry works best for the project with regards to budget, color, available storage and sizes, quality level and lead time. Next, we select tile/flooring materials and countertops, as well as the metal finishes. SLHL: Before starting construction, is it a requirement to have all selections made and purchased? Anne: Absolutely, 100 percent, yes! It makes everyone’s job SO much easier. However, I’m not impossible to work with, and I realize that paint color and cabinet hardware could wait just a hair and are a little more personal choices for the client that can’t be made until they are in the space. So, those are about the only two items I will be lenient with if it works. SLHL: What is an unexpected expense you can run into when remodeling a bathroom? Anne: The most common unexpected costs we’ve run into would be mold that was hidden, not having appropriate insulation in the walls and having to replace a rotted subfloor. These are all labor expenses. If we only had x-ray vision, we could foresee so much more! SLHL: What are alternatives to glass doors in a shower or tub? Anne: I recently have had more clients asking for walk-in showers and bathtubs with shower curtains to add a pop of color or pattern. What I like about the shower curtains is that it does make a bathroom look softer and have fewer echoes. If you like the look of custom glass and seeing the gorgeous tiled designs in your shower, there is an option for clients to get an EnduroShield treatment applied to glass at the factory. It acts as a wax filling in pores on the glass surface, making it much easier to keep clean. Plus it has a 10-year warranty on it. SLHL: How do you determine what kind of lighting and how many lights you need in a bathroom? Anne: You can’t have too much lighting! I like using a “5-inch recessed can light spaced every 5 feet on an 8-foot ceiling” method. It gives great overhead and task lighting. I always light a shower or bathtub using a water-safe recessed can light. Recently, I’ve been using the new can light/exhaust fan product by Broan. Then comes the ambient lighting. I love wall sconces! If there is room along the length of the vanity, I will put recessed canned lights over the sinks, and put wall sconces on each side of the mirrors. If not, I will put a two-or three-light fixture over the mirror. SLHL: What trends are you seeing in sinks? Anne: Hammered stainless steel has become very popular recently. It goes great with the gray and white trend, as well as other tones. It complements a lot of faucet styles and finishes, and it adds another jewelry element. Plus, it doesn’t tarnish like polished or hammered nickel may do.